Steel plates are great to get a lot of weight on the bar easy. This is the right choice when you train indoors and do powerlifting. If you drop the plates a lot, lift overhead and want to train outdoors, go with bumper plates. I personally would not bother with LBS plates in a professional setting. All records in lifting are measured in gs and competition also prefers kg over LBS. If you are buying for yourself or for a gym full of beginners, consider LBS plates as the math will be easier for you and your clients. If you are buying for your own home gym I would tend to 3 times your own bodyweight. This way you will not have to buy twice and be stuck with double shipping cost. If you are fitting out an entire gym I would say 90kg per station with a plate tree for every three squat/bench stations with a full set of pairs, unless you training a major league team that eats plates for breakfast. The Rogue calibrated steel plates come in KG and LBS nominations. They are popular for powerlifting purposes as they can fit a lot of weight onto a bar. They are also approved by the IPF and therefore be used for official powerlifting competitions based on their high level of precision. In the manufacturing process, each plate will vary in weight when it is finished. The cheaper the plate, the more variance you will have. Calibrated plates are made with better quality machines and add one production process at the end which is the calibration. What happens here is that the plates are weighed and then there will be a disc placed into little holes at the back of them to adjust to within 10grams of the desired weight. Calibrated steel plates are very good when you want to fit as much weight in as little space as possible. As long as you do not want to drop your weights this is great. Calibrated steel plates are the ones you will use in competition in a powerlifting meet. They will also take up less space in your gym than bumper plates for the same amount of weight. The color coding looks cool and gives any gym a little extra feel of being professional when it comes to getting results. With these, you can train like a real champion. Steel plates are not ideal for overhead lifts. They spin differently than competition bumper plates and behave differently when you switch direction during the lift. They also suffer from dropping or heavy use a lot more. Especially the calibration discs can come loose and start to rattle or fall out over time altogether. Calibrated steel plates with LBS nominations are the same plate style but take out the thinking for you when you prefer to lift in pounds. If you do not want to compete this might be an option, as the international standard for the IPF is to measure the weight lifted in kilograms. Competition bumper plates can be a good alternative if you focus more on weightlifting than powerlifting in your local gym. These plates are specially designed to be used in Olympic lifts. Dor this purpose they have a metal core and bumper surroundings. The only downside with these plates is that you can not fir as much on the bar as with steel. But you were not planning on overhead pressing 400kg soon, weren't you. 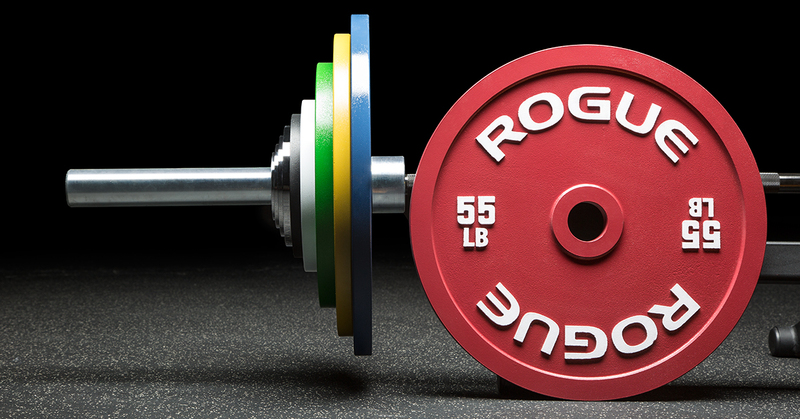 The most durable and high-quality plates you can get from Rogue are the Urethane plates. Therefore, they are also the most expensive. You can basically think of these as the steroid version of the competition bumper plates which last longer. If you will drop your plates often and use them outside for overhead lifts, this might be the way to go. 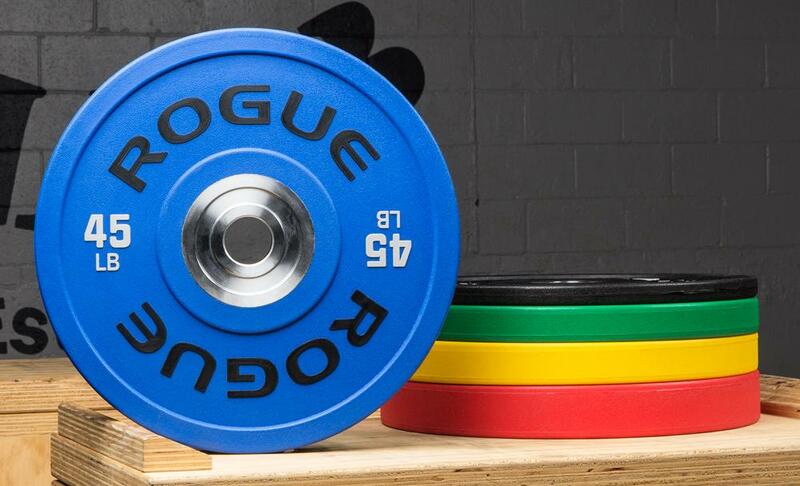 The Rogue Black training bumper plates have a unique design with a color-coded stripe to identify the weight easily. All of Rogue's top engineering is combined in these plates. The little things do make a difference, even in something so simple as bumper plates. These plates raised rubber around the center and at the outskirts. This makes them easier to pick up from the ground and avoids wear and tear at the middle metal discs. In addition, these plates are normed to the same diameter. This is great for weightlifting purposes. If you want a good, cheaper alternative to the official competition plates, this is the way to go. Based on the Durometer they score a 94, which means that they are pretty hard and have therefore less bounce. The black training plates will be an eye-catching feature for your gym which enables you to train Olympic weightlifting at a lower cost per station than the official competition plates. You will have all of the quality and luxury of competition and a well thought out design which is user-friendly. The extra features of these plates make them less prone to get wrecked than the competition plates. They will also continue to lock nicely even if they get abused. The hard bounce will make you train like a champ. On top of that, you will save a little money compared to getting the full-blown competition plates. These plates have a pretty high price tag for a piece of equipment that will be thrown around in your gym on a daily basis and abused. If you specialize in powerlifting these plates will also take up more real estate on the bar for the same amount of weight. The black training plates are also available in LBS denominations. If you run a gym where people prefer to calculate their weights in LBS and you still want to provide the best bumper plates there are, this is the way to go. 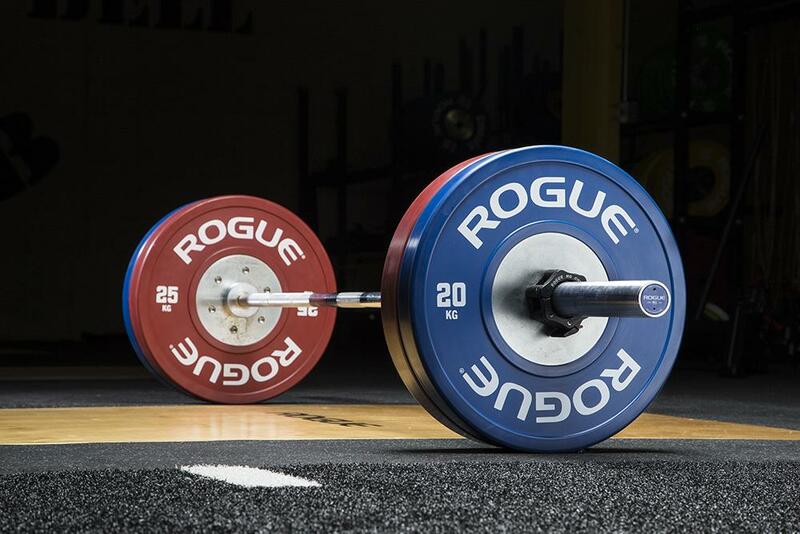 The Rogue competition plates are what is being used on the platform in official competitions. The main difference to the black training plates is that their colors run through the entire plates. They are also more prone to get broken when abused, as they do not bear all of the extra features that the training plates have to protect them from harm. If you want to save money and know that your clientele does not care that much, bumper plates are your go-to option. These are a lot cheaper than the black training plates and can also be dropped from overhead. If you train outdoors or in a wet dungeon/cellar, I might get these as the plates well get wrecked anyway. The Rogue color KG training plates come in full color just like the competition plates and are specialized in Olympic weightlifting. These plates can be used in training and still life up to the IWF standards, You can choose from 10kg, 15kg, 20kg, and 25kg plates. These plates come with a 450mm diameter and collar opening of 50.4mm. They score 86 on the durometer which means they a little more bounce than the top range plates from Rogue. They also have been designed to be thinner and fit more weight onto the bar. The weight tolerance on each of these is around 15 grams per plate. These are the right plates when you want to get the real competition feel going for your Olympic lifters in your gym while still saving some money compared to competition plates. These plates are great for training purposes and cost less than actual competition plates. You will fit more of these onto a regular bar compared to normal bumper plates. The color coding will set your gym apart and make it easy for athletes and coaches to identify the weight on the bar. The color coding is not ideal in gyms where the plates will be used on and off a platform. They will quickly take on lose color and dirt will be easily visible. The higher bounce rate compared to higher end Rogue products makes it more likely for them to break. This also means that they are a bit more dangerous to train with for beginners as they are usually not used to bouncing weights. If your clients or yourself prefer to train in lbs rather than KG but like the color coding and a bit more bounce, than the LBS version of the Color training plates are an option for you. If you want top-notch training plates which match the rest of your gym and are more durable, you can opt for the Black training plates from Rogue. These have less bounce and a couple of extra features on the plate which make them more beginner friendly. If you want to save money and do not need to max out the weight that can be put on the bar, the bumper plates are a time tested solution for any gym. Not fancy, but they do the job and you save some $$$ per kilo. These plates are Rogue take on the standard metal plate. They have come up with a great design which combines grey hammertone with black writing. Many lifters love the sound of multiple metal plates clanging together when they post a new pr. These plates are made to precision with a 2 to 3% tolerance which sets them apart from the rest of the industry. These are the type of plates which a no-nonsense dungeon gym will hold. You get quite a lot of weight for your dollar with these ones. The biggest pros are the price and machine precision. Compared to the calibrated steel plates and high-end bumpers you get the same amount of weight for roughly half the price. Metal also feels different when you move it around. It makes more noise and just feels rawer. You will also be able to fit more weight onto your barbell. These plates have no color coding and you can not always be sure what you put on the bar. This makes it more likely to misload a lift. If you do not have a platform these plates are also a lot more likely to eat into your floor on deadlifts than bumpers. They will also not sustain constant dropping of the weight from overhead. Especially your barbell will suffer and deform quickly if you use them for Olympic lifts. In addition, they will also not age well in damp places as they will oxidate. If you still want that metal feel, can tolerate a bit more variance on the finish and prefer black, the Rogue Olympic plates might be for you. They will also come in at an even lower price point. Bumper plates are the alternative for the home gym warrior who wants to protect their floor and lift overhead. You will fit less weight on the barbell, but you can train without a platform without wrecking the floor. The calibrated steel plates come with color coding and are IPF approved. If you want to prepare for your next powerlifting meet and train like the pros, this is the option for you. 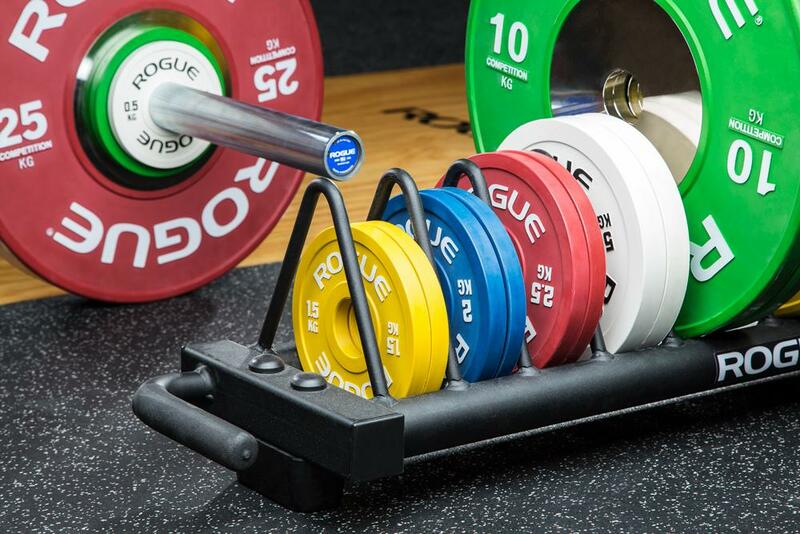 The Rogue 6 shooter plates have been designed for high traffic use in your gym. The plates provide six holes so that it becomes easier to transport them and load them onto the barbell. This is the type of plate you want in a facility with many beginners to avoid hand injuries. They also come in at a lower cost than most other plates. When these are being abused, your heart won't sink as much as with the other, higher range plates from Rogue. They come in a hammertone grey finish. The Rogue 6 Shooter plates are easy to handle for any level of a lifter. They are also less likely to provide hand injuries as the holes lower the likelihood of getting your gingers between two plates or not being able to pick them up. The design also makes it easier to use the plates for any kind of resistance exercises which are not done with a barbell. This combined with a relatively low price makes them a good option for starter gyms for their first-time outfit. These plates are metal and are therefore unforgiving to the floor, humans, and feet when dropped. They are also not ideal for Olympic lifting for the same reason. Many clients in commercial gyms also prefer urethane over metal as it is easier to handle and feels nicer on the skin. The Urethane version of the 6 Shooter plates are a bit more expensive, but last longer and feel nicer for your clients. This is the way to go if you want to accommodate to the masses. Bumper plates are an alternative which is also lower in price. These plates can be dropped from overhead and are forgiving on surfaces they get in touch with. A disadvantage is that you can not fit as much weight on the barbell with bumper plates than with metal. Olympic plates are the no-nonsense most cost-efficient option you can go for. This is the most weight per $$$ you can obtain from Rogue. The downside is that these plates are not much to look at and are hard to handle. This is a specialized tool when you get serious with your powerlifting to get more volume in without wrecking your lower back. They also cost less than proper pulling blocks. If you only need blocks for powerlifting purposes, this is a great option which is easy to store in your gym. The Wagon wheel saves space and time when you want to deadlifts from a block. They also cost less than their wooden or metal blocks which fit the same purpose from Rogue. The Wagon wheel cannot be used for Olympic weightlifting style block pulls or jerking. For jerking, they are too low and for dynamic block pulls the metal is too hard on the floor and wrists of the lifter. For Olympic weightlifting, you are better off to buy proper jerk blocks. The metal jerk blocks from Rogue are adjustable in height and beasts to behold. These are space saving compared to their wooden counterparts as you do not need multiple of them to stack higher up. Wooden jerk blocks take up more space in your gym than the metal blocks offer the same height options, but are in turn more modular. With one full set, several athletes can train from different starting positions. The HG Bumper plates are the workhorse in the plate portfolio of Rogue. If you want cheap plates with a three-year warranty which do the job, this is your place. These plates will last, can be abused in any kind of way and will perform. The disadvantages of these plates are that they are harder to handle than 6 shooters and do are as plain as they come. They score 88 points on the durometer scale and have therefore slightly more bounce than the high range options from Rogue. The only color option for these plates is black. This is the no-nonsense choice if you are starting out and just want weight. These plates will not oxidate and can be used outside. If they reak your heart won't sink and you just replace them. They will be forgiving when dropped on feet or on the skin. Hurting your fingers is less likely than with other plates. You can drop them from overhead. Take your pic. These plates look dull and you can not see what you have exactly loaded. You also will not fit as much weight on the bar than with higher price ranged options from Rogue. It is also more likely with these plates, tat th weight varies more considerably compared to what is stated on the plate. The 6 Shooter Urethane plates are another workhorse option with a different design. The six holes make it easier for athletes to handle the weight. These plates can also be used for workouts without a barbell, which is hard to do with bumper plates. Olympic weights are the ultimate plate for getting as much weight as possible on your bar at minimum cost. These metal plates are not fancy, but weigh a lot while not taking up a lot of space on the bar. If your gym should make clanging and banging noises, this is the plate to get. Competition plates are the Nascar version of bumper plates. These plates are color coded so you can easily see how much weight is on the barbell. They also have a steel core which makes them behave better when you change direction for the Olympic lifts. 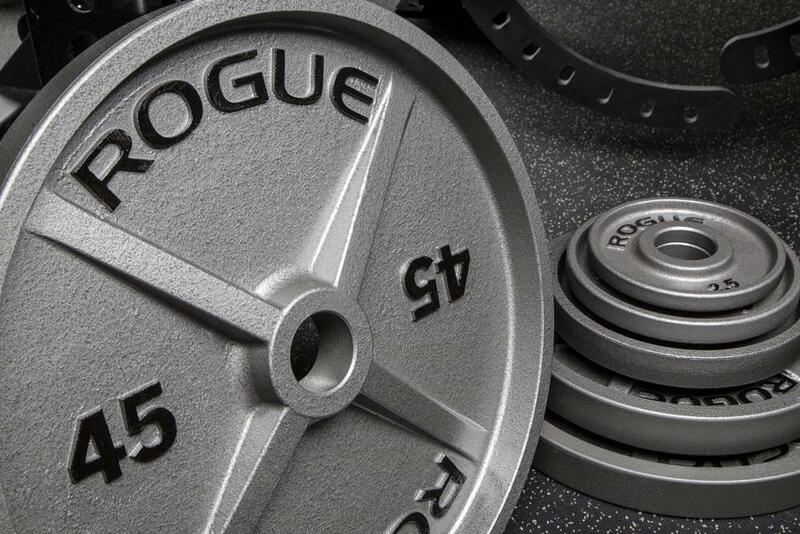 The Rogue Urethane plates are the second most expensive ones in the Rogue portfolio per kg. What you get in return are the longest lasting, all weather plates you can obtain from Rogue. These plates are 450mm in diameter and made to IWF specs. They have a chrome insert and dead bounce on the drop. The chrome piece provides easy loading on the bar and reduced friction on the sleeves. This is the plate to buy if your last competition plates fell apart at the chrome insert. This is an all-purpose plate which will last a long time and is hard. It will take the abuse of many users of different experience levels and still look good. This is a great plate for high demands and someone who does not want to replace the plates as often compared to other plates with a chrome insert. The biggest con is the high price. If you go for Olympic or bumper plates you will get a lot more kilograms per $$$. You might be buying twice in this scenario and you will also know that you took the cheap road to success. I personally stopped doing this and it yields great results. Competition plates will not last as long as they have a tendency to pull apart between the rubber and the chrome insert. They also bounce more. Still, if you want to get as close as possible to the real world championships, then these are the plates to go for instead with the slight risk that they might fall apart after years of heavy use. The black training plates are a great design from rogue which combines the bumper plate effectiveness with the excellence of Rogue's competition grade plates. You will find color coding and extra touches to make the plates more user-friendly and robust. This is the elegant choice of the professional. Calibrated steel plates are the plates for anyone who wants to put the maximum amount of weight possible on the bar while still having color-coded plates. These plates are also approved by the IPF and are used in competition. If you want to get serious about powerlifting, this should be your choice. These are the best that Rogue has to offer. Repeatedly used on Olympic lifting competitions and the CrossFit games these are the plates to behold when it gets to competition day. The plates have been updated with better design, lettering, and raised rubber to make them last kong and look good. They have minimal bounce and provide everything you need to post new personal records for your Olympic lifts. 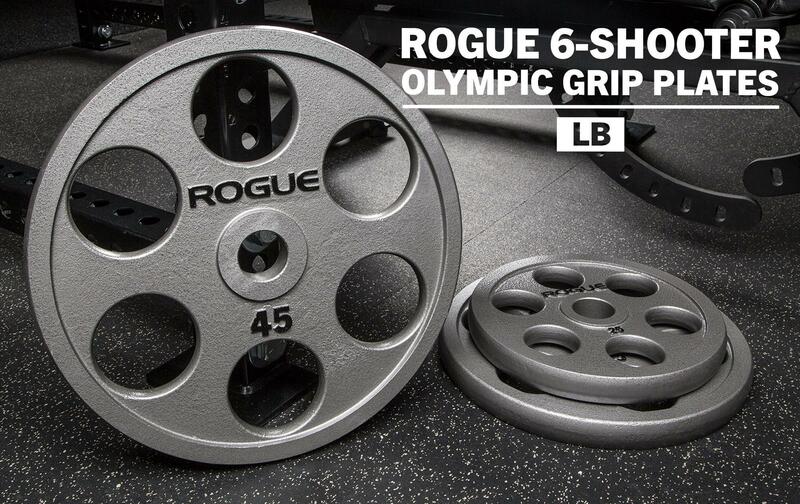 These are the best plates you can get for Olympic lifting from Rogue. There is not really much more to say about them in terms of pros. High quality has a high price. If you want to save money on plates you might want to go with bumper plates instead. 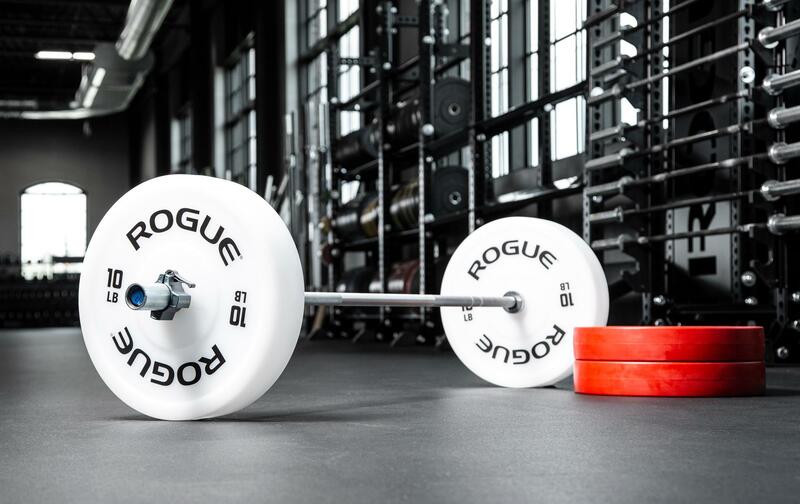 Bumper plates are the ultimate workhorse piece of equipment you can get from Rogue. They come in at less than half the price per kilo than the competition plates. With the saved money you might want to buy extra barbells or kettlebells depending on your needs. The disadvantages are that bumper plates are not color coded and also do not fit as much weight on the bar than competition plates. Calibrated steel plates are the go-to for powerlifters who want precision and maximize the weight on the bar. These plates are color-coded and precision manufactured. With the seal of approval from the IPF, you can begin your journey to the podium of your next powerlifting meet. Black training plates are a great combination of practical training plates and high standard competition quality. The design of these plates makes them a good fit for everyday use while still keeping the mindset of a champion. Technique plates are special plates which have the same diameter of 450mm than regular competition plates but at a much lower weight. This is achieved by using high-density polyethylene Plastic (HDPE). These are the right plates to teach beginners, juniors or getting rehabbing athletes back to lifting. These plates combined with a technique bar can lower the weight of the bar for a beginner to 15kg to enter the sport of Olympic weightlifting. If you work a lot with children or very unfit beginners, this is a good plate to add to your arsenal. Technique plates help to ease into the sport and to hone your lifts to perfection. If your gym or yourself are serious about Olympic weightlifting they will be a great addition to your arsenal to grind on technique without wreaking your body. These plates have a very narrow and specialized use case. If you do not enter the realm of Olympic weightlifting you will probably only get very little use out of them. Fractional plates and change plates help you to work with lower denominations in work and to microload. In most cases you will get more use out of these for everyday training than out of technique plates. Rogue Fractional plates come in pairs of 0.125kg and 0.250kg. They are a helpful tool for the most advanced athletes to steadily increase the weight being lifted. They can also be used on beginning athletes or anyone who is facing a plateau. These plates allow you to increase the weight on the bar in increments which are smaller than 2.5kg and therefore provide more options for your training. Fractional plates are a great tool when you know how to use them. For programs like Jim Wendler, you want to use them as they break down the weight increments very finely. These plates get easily lost or stolen. Also most people in your gym will not know how to use them probably and scatter them all over the place as they are so small. More options for you to push for your limits and a cool design. Easily lost or stolen because they are so small.